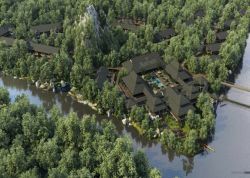 Built in 2015, Mulu Marriott Resort & Spa is nestled in a lush tropical Borneo Rainforest, near the outskirts of the UNESCO Gunung Mulu National Park. The hotel is about six minutes from the airport. With its convenient location, the hotel offers easy access to the city's must-see destinations. The facilities and services provided by Mulu Marriott Resort & Spa ensure a pleasant stay for guests. The 24-hour front desk, luggage storage, room service, airport transfers, and meeting facilities are just a few of the facilities that set this property apart from other hotels in the city. Guests can choose from 101 rooms, all of which exude an atmosphere of total peace and harmony. The hotel offers an excellent variety of recreational facilities, including a fitness center and outdoor pool. Superb facilities and an excellent location make the Mulu Marriott Resort & Spa the perfect base from which to enjoy your stay.